Every second counts with often impatient mobile users, so Google wants to help publishers reduce the time it takes their articles to load when viewed on smartphones. On Wednesday, Google launched a program called Accelerated Mobile Pages, or AMP, which speeds up load times by plugging a piece of Google code into publishers' websites. Google claims its tools cut down load time between 15 percent and 85 percent in initial tests. Here's how it works: A reader discovers content via Google's mobile properties before clicking through to the publisher's site, where the quick loading occurs. If the same reader goes directly to the publisher's website for the same piece of content, the load time will be slower. Beta partners include BuzzFeed, The New York Times, The Washington Post, the Financial Times, Vox Media and the Daily Mail. AMP is scheduled to roll out more widely in the coming months. Publishers will be responsible for monetizing their own content, selling ads as they already do. Google claims it is not giving higher search rankings to publishers that use its tools, but speed will be a factor in determining where a news article appears in search results. "The Web today, particularly in the mobile environment, is not really fully satisfying users' expectations," said Richard Gingras, Google's head of news and social products, during a press event Wednesday in New York. "And advertising, which obviously is the lifeblood of many institutions creating content on the Web, often provides great, compelling advertising experiences but also presents experiences that are a bit more annoying than they are helpful." Google is the latest tech company to cozy up to media brands as they look for new distribution models. Unlike such programs as Facebook's Instant Articles, Apple News and Snapchat's Discover, though, Google's AMP does not come with any deals or partnerships. Instead, it's an open-code initiative that any publisher will eventually be able to participate in. In fact, Google is partnering with Twitter so publishers' same fast-loading stories open equally as quickly when someone clicks on a tweet in the microblogging site's news feed. 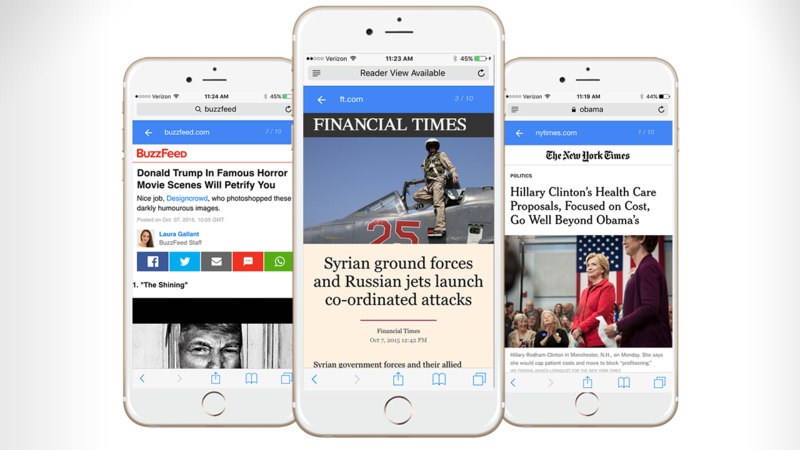 Cory Haik, The Washington Post's executive director of emerging news products, said that 60 percent of the site's traffic comes from mobile and that there's a staff specifically dedicated to the app. But it doesn't have the same resources for its mobile website, so the hope is that working with Google will improve the reading experience. "The Web is sort of the Wild West, or as my colleague says, 'the worldwide wait,'" Haik said. "We've made a lot of improvements, huge gains on the performance on the desktop Web and some on the mobile Web. But it's hard—it's complicated."